When picking a career path for one self there are several factors that need to be kept in mind. Along with your philosophical bent of mind you need to ensure that you have the necessary ability as well as people skills which the job entails. 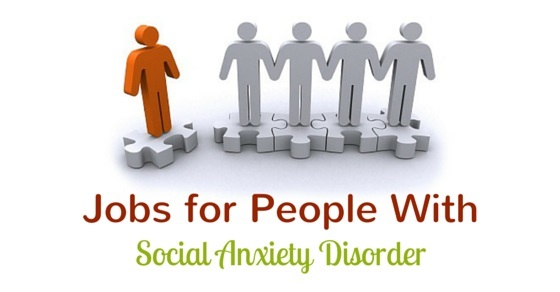 Social anxiety disorder is a seriously psychological problem which many people have to deal with, if you are one of these people then do not worry; here is a list of some of the top jobs for people with social anxiety. One of the best things about being a school teacher is that your job requires to constantly be in contact with only children. Socially anxious people find it difficult to open up during large social gatherings or even talk to people without stammering or stuttering, however they usually love children and are able to get along with quite easily. This is because children are not judgmental, rather they are innocent and loving. When you are a caregiver to a young child or an extremely old person then chances are that you will not feel awkward at all because your exchanges are mostly on a one on one basis. Though no one claims that these jobs are easy, yet they are rewarding as you get to help those who are unable to take care of themselves. There is a great demand for responsible caregivers and people are even willing to pay great sums to ensure that their loved ones are well taken care of. For any person who suffers for social anxiety one obvious advantage of becoming a researcher is that you get to work alone in the confines of your office or laboratory without having to go out and interact with people. So even if the thought of going out and mingling with other people makes you exceptionally nervous and even a little nauseous having a job as a researcher will do just fine for you. Ensure that you have an analytical bent of mind though. When you become a full time blogger then you have the freedom to be your own boss and in addition to this you can work from the comfort of your own home without having to adhere to any sort of strict deadlines. However for a socially awkward person one main reason why blogging is a good career path is because you do not have to interact with anyone face to face and even if you have people working under you, you can text or mail them. Having a front office job will often require you to talk and interact with customers, clients as well as bosses who might walk through the doors of your office at any given time, however if you have a back office job then you will never be put in a position where you have to interact with anyone. All your job requires you to do is work on your computer and organize your files without having to bother about social niceties or decorum. Wildlife photographers spend the greater part of their lives away from the hustle and bustle of city life without having to interact with other individuals. If you are socially awkward as well as interested in biology, wildlife and the natural environment then this is certainly your calling as in the wild there will be no scope for you to attend big social gatherings or meetings which make you feel uncomfortable and even rather awkward. Having to battle with social anxiety on a daily basis is no laughing matter at all. If you know what it feels like to suffer from it then you could seriously consider getting a degree in psychology and becoming a psychiatrist where you will be able to help innumerable others who might be going hell on a daily basis. When you help them deal with their anxiety you are bound to feel better about yourself and that feeling is truly priceless. Most people who are socially anxious love pets, and find it much easier to get along with pets as opposed to their fellow human beings. If you are one such person then you should give this career path a thought because many people consider their pets as family and they are willing to pay any amount to make sure that their dear pets are treated with love and care. So besides making a good amount of money you will also be doing something you love. Though social situations might make you feel very uncomfortable but if you have a passion for cooking, you could always consider becoming a chef. Chefs always work hard and unlike waiters and even bartenders they do not require social skills. All they have to do is come up with delicious things to cook, prepare the food well and then make sure it is served properly. And just so you know the restaurant business is truly a thriving one. If you love being in the lap of nature and getting your hands dirty then this is certainly a job for you. Gardens and landscape designers spend hours under the open sky, creating magic with their hands. There is a great demand for both these jobs as people are willing to spend good money to ensure that their houses as well as their offices look good and pleasing to the eyes. Though you might think that if you want to become an author or a writer you have to have good social skills, especially to be able to go to book launches as well as book meets, however do not worry about this as there are plenty of exceptional writers who are socially awkward and prefer not to go on promotional trips and talk shows. So if you have a lucid style of writing then just focus on writing a good book without worrying on promoting it, if it is good people will read it. Painting is one of the most relaxing jobs out there by which people give vent to their emotions as well as their feelings. Most people who are into art are immersed in their own little world and find it tough to communicate with others through words and they also find big crowds at social gatherings very daunting and overwhelming. So if you love to express yourself through art then painting is certainly something that may interest you. Photographers are individual who are able to find beauty in the midst of ugliness. They take notice of things that other people may easily over look and since they are constantly emerged in their quest for beauty, these shutter bugs cannot give vent to their views coherently though speech, Instead their pictures communicate clearly their frame of mind. One of the best things about being a sportsman, if you feel socially anxious is that you spend so much of your time training and working that you hardly ever have to interact with other people in social gathering. There are plenty of sportsman and women who deliberately shy away from the spotlight because it makes them feel uncomfortable, but when it comes to their sport, they ensure that they give their hundred percent at all times. People in this field spend their entire lives studying and trying to reconstruct the past and therefore they hardly ever have the time to go out and interact with others. If you have a love for history and find that the glory of Egyptian, Mesopotamian and even the Chinese civilization just won’t escape your mind then you should know that this is a job that you could be great at and you would not have to worry about having any people or communication skills. Contrary to popular believe being a stay at home parent is indeed a twenty- four hour job, so instead of paying a big sum of money in order to hire a maid or a nanny you could always just stay at home, around people you love, so that you do not have to be unnecessarily anxious through the day. So these are some of the main jobs that you could consider trying your hand at if you lack people skills and suffer for acute social anxiety when you are in a big crowd or are forced to meet and converse with new people. These jobs are interesting and you are sure to love them especially because they will give you the opportunity to give vent to your emotions freely.